Luckily for you, there are some great options! 1.) If you came straight to this page from a web search, click the home button above to begin reading all the Richie comics posted on this blog. OMGBEAUPEEP has tons of Richie Rich and Casper posted, you will be very, very happy! This nice person has uploaded a whole comic you can read. 3.) Dark Horse has an entire book of Classic Richie. It’s all in black and white which stinks, but you do get used to it. Unfortunately, they did not publish enough copies and it is selling for quite a high price on ebay, but my local library has a copy and yours might too! 4.) For non-immediate gratification, there are always Richies selling on ebay. And there are some great digests that came out in the early 90’s on better paper stock with better ink that are easy to read and not yellowing and falling apart like the 70’s versions. The only negative is that you often purchase digests you already have because the new covers are different. It is nice to have them on the better paper so it’s not terrible, but it’s annoying when you were salivating for new Richie stories. See below, my old Richie from the closet and the new one I thought I was buying. This is not retouched, the new versions just look so much better! 5.) Ape/Kizoic came out with some new issues of GEMS in 2012. They contain recolored old favorites, new 2012 Richie Rich drawn in the new style, AND some new stories drawn in the old style by Ernie Colòn and Sid Jacobson! You can order them from Amazon or check your local comic book store. 6.) Download the Richie Rich App in the App Store for your ipad or iphone. THIS APP DOESN’T WORK WITH IOS7 or IOS8, SEE NOTE BELOW. Ape Entertainment has created an app that allows you to download classic Richie and Casper comics that have been digitized for your electronic enjoyment! You can download free previews as well if you’re not quite ready to purchase. $1 gives you 28 pages of classic Richie to read, with no filler. That means, no ads, no Little Dot, no Little Lotta, just Richie. For comparison’s sake, I just bought some Richie comics (not digests) at Comic Con 2013 for $3 each and when you subtract the filler, I probably had 12 pages of actual Richie to read. So, it’s a great deal! If you like/hate Crashman and Rippy, it’s even better because they are grouped C&R and non. You can get a whole comic of just C&R! Or, in my case, I hate C&R so I happily have not bought those four. They are so easy to read. 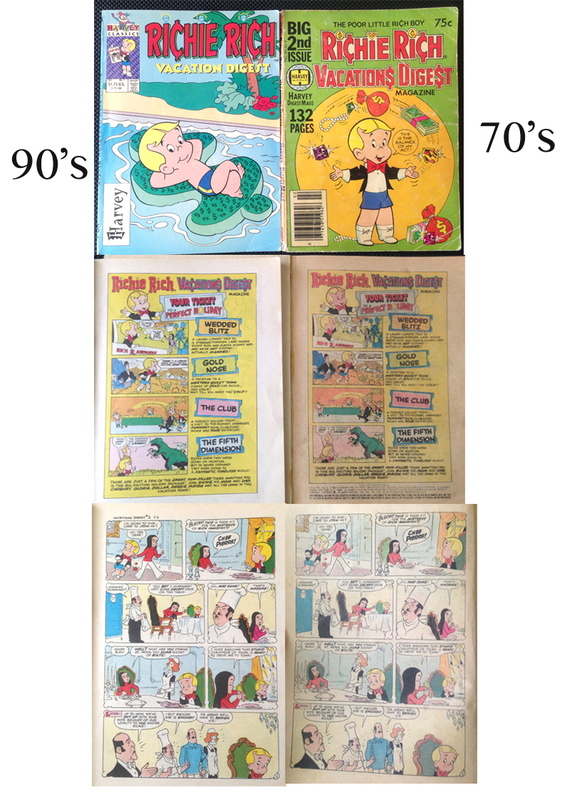 If you’ve pulled out your old Richie comics recently, you will see that the yellowed pages and tiny print make them fairly difficult to read. But, getting them on the ipad is great! You can enlarge the frame and read happily with no fear of damaging fragile pages. Only the first story is in color, the rest are black and white. It is a hard transition after the first story, but you get used to it. When you’ve found some Richies, please tell us about any great stories you’ve read below! This entry was posted in Uncategorized and tagged Occupy Richie Rich, Richie Rich app, Where to buy/read Richie Rich comics.